With the rise of the guild, master craftsmen and the marchand-merciers — the celebrated dealers and tastemakers of the time — Paris became the epicentre of European style in the 18th-century. As highly skilled craftsmen flocked to the French capital, technical development and artistic innovation continued apace, and the luxury goods market boomed. French tapestries, lavish silks, porcelain, clocks and cabinet-work were commissioned by Royals and aristocrats across the continent. One such example, an exquisite Louis XVI ormulu-mounted, satin-wood, amaranth and sycamore commode, comes to auction on 30 April as part of the Desmarais Collection: A pied-à-terre in New York. The commode is stamped by Jean-Henri Riesener (1734-1806), arguably the most celebrated cabinet-maker of the late 18th century and a favourite of Marie-Antoinette. Jean-Henri Riesener (1734-1806), a Louis XVI ormulu-mounted bois satiné, amaranth, sycamore and marquetry commode, stamped JH Riesener, with painted Inventory number ‘2803’, 1774. 37½ in. (95 cm.) high, 65¾ in. (167 cm.) wide, 25½ in. (65 cm.) deep. Estimate: $700,000-1,000,000. Offered in The Desmarais Collection: A pied-à-terre in New York on 30 April 2019 at Christie's in New York. ‘It’s a magnificent example of Riesener’s unparalleled technical skill, for which he has always been internationally renowned,’ says William Strafford, European Furniture and Decorative Arts specialist at Christie’s in New York. Made in 1774, the break-fronted commode with marble top was commissioned by Madame Randon de Pommery for her bedroom in the Hôtel du Garde-Meuble. Supported on four short out-turned feet, it boasts two principal drawers beneath a frieze divided into three shallow drawers. The remarkably life-like floral marquetry, inlaid in a trapezoidal central panel with curved sides, is flanked by fruiting laurel branches of gilt-bronze. The grand proportions of the commode, the scrolling foliage and naturalistic depictions of flowers are, says our specialist, characteristic of Riesener’s mature style. Its laurel branches are also the second known example of what would become one of the cabinet-maker’s most distinctive motifs as he developed his signature style for the Royal court. Under the regulations of the guild system in 18th-century France, furniture production was divided into its constituent parts. Tens of artisans — to include ébénistes (cabinet-makers), bronziers (bronze-casters), ciseleurs (chasers) and doreurs (gilders) — could be involved in the production of one luxury piece. The process of crafting a commode of this quality would have been ‘extensive, expensive and extremely labour-intensive’, says Strafford. Indeed, the 1774 commode did serve as an important prototype for three subsequent Royal commodes, delivered to the French Royal Family between 1776-1778. All three of these commodes follow the overall form of the Pommery commode, but refine it further to befit their Royal patrons. There’s a richer scheme of gilt-bronzes and the addition of geometric parquetry panels adds greater depth. As the 1774 commode was commissioned by Madame Randon de Pommery for the Garde-Meuble de la Couronne, an organisation within the royal household responsible for the upkeep and furnishings of all Royal chateaux in France, it was documented in the same manner as a piece of royal furniture. The painted inventory number ‘2803’ to the reverse identifies it in a meticulous series of documents and inventories still held in the French National Archives. These include Riesener’s bill in December 1774 for 1586 livres, which he then reduced to 1300 livres, perhaps to gain further favour with his new employers. The commode remained in the Hôtel du Garde-Meuble until 1795, when it was sold, together with the remaining contents of the property, at auction in Paris in the wake of the Revolution. ‘It’s very rare that such a well-documented Riesener commode comes to market,’ reveals Strafford. ‘Such exceptional 18th-century provenance is likely to make it very desirable among serious collectors’. 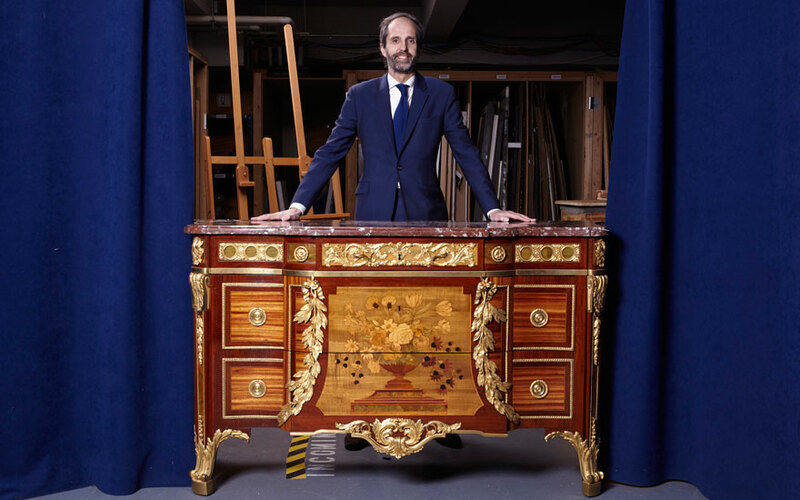 William Stafford, European Furniture and Decorative Arts specialist at Christie’s in New York, with an 18th-century Riesener commode, dating to 1774.